Years are funny things… decades even more so. Though the parameters of them remain constant they’re still essentially arbitrary dividing lines which color how people think of things depending on what happens to fall into one year, or one decade, and another. 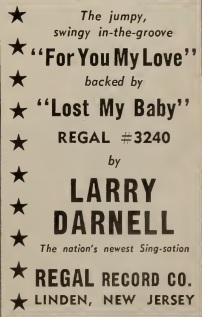 Case in point: Larry Darnell, a twenty year old rock artist just starting out in the business… someone who had his entire career in front of him and yet he’d be forever relegated to being viewed as a 1940’s artist because his two biggest hits were his first two records released in 1949… his ONLY two records released in 1949. This was the second of those records and his biggest hit which in many ways wound up rendering the next twenty years of his career a mere afterthought. During the two years of rock history we’ve covered thus far we’ve tried to look at things from that contemporaneous historical context as much as possible. In other words, rather than let our accrued knowledge of what was to follow over the next seven decades in rock taint our impressions of what happened when the music was just starting out, we’ve attempted to view things through the lens of those who made it at the time. One of the more interesting elements this has led to is trying to gauge who was setting themselves up to be the stars of the rock field as it moved forward. Now of course we KNOW who did become stars in the future. We’re fully aware who had hits down the road and who didn’t, and who exerted the most influence on the course of rock in the next decade or so. That much we can’t excise from our brains even if we wanted to. But one of the really insightful parts of this project has been seeing who seemed poised to become a star only to see them fall off the radar in short order, which allows us to try and figure out why they didn’t fulfill their early promise. With some like Goree Carter and Andrew Tibbs, it might’ve been due to record labels that hadn’t found their way yet, whereas in other cases like Jimmy Liggins or Chubby Newsom it had more to do with a lack of stylistic variation that held them back. Now we have somebody in Larry Darnell who DID become a star right out of the gate with his first two releases both being huge hits, yet in very short order he became a middle-of-the-pack performer, if that, and though he’d wind up lasting two decades on the rock scene he never again commanded even a fraction of the attention that he did at this point in time when he was an untested 20 year old wunderkind. So I suppose now that we’ve already established his ultimate fate as an also-ran, thereby removing all of the surprise from his next three dozen or more reviews through 1969 (stick around anyway, gang! ), let’s focus instead on the moment when it seemed as if the surest bet for long-term superstardom in rock ‘n’ roll rested on the slender shoulders of Larry Darnell, an Ohio kid transplanted to the fertile musical soil of New Orleans who was about to become the biggest thing in all of rock in the final days of the Nineteen-Forties. 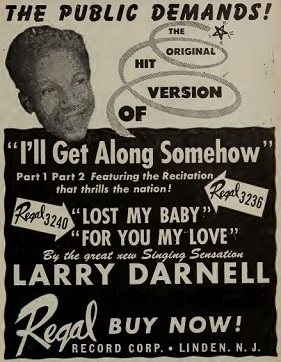 One thing we need to mention because it’s so unusual and seems so counterproductive on its surface, is the fact that both of Darnell’s big hits – his first two records no less – were issued pretty much simultaneously on the market by Regal Records, a few weeks apart at best. Why they did this nobody can answer and the fact it actually turned out alright – well, more than alright as I’ll Get Along Somehow went to #3 nationally and this record topped the charts for eight weeks – makes the question seem less important, but it still needs to be asked. Why would you risk wasting a good record by having another one by the same artist cancel it out? Furthermore, since Darnell was just starting out and thus had no name recognition anywhere outside of New Orleans where he’d been drawing customers to The Dew Drop Inn since his arrival, there was every possibility that it’d take some time for a national audience to discover him. That’s why you release one record, try getting it on the local New Orleans charts and then use that popularity to gradually infiltrate other markets as distributors see its success in one city and figure it has the potential to break elsewhere. That’s how things were generally done and during an era where the means for exposure with rock ‘n’ roll was fairly limited – not many radio stations played it and there were only 25 slots available on jukeboxes – it meant that flooding the market would backfire more often than not. We’ve seen it already as some companies rush to follow up a song that’s breaking with another record by the same artist only to have it get lost in the shuffle. By contrast those who spaced out their releases and let the first hit run its course generally had better luck scoring a second hit months down the road because audiences were eagerly anticipating something new. Sonny Thompson for one wound up benefiting from this method of judiciously timed releases as he notched four hits with just three singles over the course of a year, though by this point it could be argued they’d been TOO cautious in their efforts to get him back in the studio to cut new material and fell behind as a result. He wasn’t the only one though, both Roy Brown and Wynonie Harris, two of the five biggest stars in rock, had fewer singles coming out now because of the benefit of letting each record have the stage to itself for a longer stretch of time. In Darnell’s case this should’ve been even more imperative so that they could get him firmly established. If they indeed had big expectations for I’ll Get Along Somehow then you’d want to give that every chance to succeed without something else of his getting in its way. Even just in terms of being better able to allocate your company’s expenses since it costs more to ship and promote two different records rather than just one. Then if his first one clicked with audiences you could conceivably wait until it dropped off the charts altogether – and in the case of “Somehow” it lasted sixteen weeks – which meant you’d be issuing THIS record sometime in March. Since that one would be on the charts for twenty-two weeks you’d have six months to then decide on his next release after that. But nope, they put them out one right after the other and shock of shocks they both entered the Billboard charts the same day, on November 12th, meaning that for the next few months Regal Records had two of five biggest selling records in all of black America, not just the smaller rock contingent within that realm. So it worked and that’s all that mattered to them, but it still seems like an ill-conceived idea. As for the record itself, For You My Love would’ve been hard to keep off the charts no matter when it had come out… not just at the tail end of 1949, but actually for a few years PRIOR to that as well! We spent a lot of time in his last review talking about how that “previous” release was so forward thinking in its structure, one of the more influential records of rock’s first few years in how it introduced the mid-song spoken dialogue to the common vernacular. But with For You My Love we find some elements that are already a bit OUT of date. Not surprisingly those center around the horn section. We thought we had put most of these complaints behind us by now, as artists, producers, bandleaders and record companies had plenty of evidence that in rock circles it was the tougher more aggressive tenor saxes that were the biggest indicator of success and the alto sax and trumpet-led “massed horn sections” that had been the staple of jazz were an albatross around a record’s neck in this new frontier. But old habits are apparently hard to break, even when the person in charge of breaking them – Paul Gayten – was one of the guys who should’ve known better. After all Gayten, both on his own records and backing up the likes of Annie Laurie, Chubby Newsom, Eddie Gorman and more recently Mr. Google Eyes, had seen the difference in power when he let someone like Lee Allen run wild with a more vibrant tenor sax part. Yet here Gayten reverts back to a jazzier mindset, especially in the intro, which conjures up a big band setting circa 1946 or so and leaves us wondering if this might not sink the entire record and send us scurrying out the door for something a bit more modern. It’s not that the lines themselves are inappropriate. If anything they’re designed to be acting as a clarion call for some big announcement to follow and as such it captures your attention enough to at least be curious as to what this news could be. But if that news told you World War Two had just ended you might not be surprised that their headlines were four years out of date. But that’s a momentary diversion because when Darnell comes in your focus immediately shifts to him and his powerful sinewy voice. He’s got a little bit of an odd tone, a nasal low tenor with good range, great resonance with absolutely tremendous control. Most impressively he’s got the ability to hone in on notes like a magnet, his pitch never wavering no matter how long he holds them which cuts right through you as you listen. Because of this almost everything he sings comes across as emotional. He could probably sing the ABC’s and have you weeping by the time he got to J, K and L.
Because he rivets your attention on him the band becomes less of an issue, though it certainly doesn’t hurt that they tone down some of their inappropriate stylistic compromises either. True, the extended solo has too many horns and not enough grit, but the melody itself and the rhythmic underpinnings it provides are both pretty good. You could even suggest that a more muscular tenor sax explosion that we generally crave around here might throw Darnell’s delicate frame under the bus and wreck the song in a different way, so I won’t fault them for their decision, even if those decisions still manage to get under your skin ever so slightly if you focus on them more than is recommended. Darnell though makes sure you don’t take your eyes off him for long, as when he returns he drops down in tone, like he’s going to reveal a secret to you and you alone, and of course you lean forward in eager anticipation to hear what juicy tidbit he has for you. Pity then that it’s nothing that you’d otherwise be compelled to hear. This leads to the other curiosity about the ultimate runaway success of this record… namely, why THIS record in particular? I mean, the performance is really good on Darnell’s part so we’ll give him all the credit we can. You certainly want to hear him sing. But sing about what? Paul Gayten wrote this and it’s certainly is a good serviceable song even if the topic itself is rather rudimentary, but it’s hardly anything dynamic unto itself, at least on paper, which makes the extent of its popularity a little more difficult to understand. For You My Love is just another in a long line of songs about expressing desire for a woman (or a man I suppose, as Darnell was pretty openly gay) as it not only speaks about all of the things he WILL do for this other party if they’ll consent to be with him, but also all of the things he’s already done to please them. There’s no frustration or conflict over making these changes to his activities for their approval, he’s not resentful that he’s even being asked to do them. At times he seems eager to do even more to keep their romance blossoming. But the platitudes themselves – about ”swimming the ocean blue” and the rather shocking revelation “I even went out and got a job!” – are nothing out of the ordinary. There’s no clever euphemisms, no elaborate wordplay or deft rhymes, nothing that will draw your attention to its contents besides the reiteration of the same burning desire that existed from the first words spoken. In other words, though there’s absolutely nothing to find fault with here, there’s also nothing much to make it stand out and explain its lasting allure to audiences at the time. All of which brings us back to the star of the show himself, the kid whose voice sells the rather pedestrian story with the urgency of kid begging his parents to stay up past his bedtime. Everything about Darnell is first rate – his voice, his emotional commitment to the message, his judgement in knowing where, when and how to bear down and also when to pull back. The vocal intro is taken at full-throttle and I’m convinced that’s what sold the record as much as anything… it just sounds like something you HAD to hear and everything he does that follows exhibits the skills it usually takes somebody years to fully master, yet Darnell is already in full command of his faculties. So he’s a great singer, there’s no question about it. But so was Andrew Tibbs. So were lots of others and their records didn’t grab the nation like this one. Maybe it’s because For You My Love is as much a full-blown performance as it is a record and that’s what makes it so appealing. The sense that this kid was pouring his guts out and it just happened to be captured on wax for you to hear at a later date as many times as you wished. Though I can’t imagine wishing to hear it MORE than I’ll Get Along Somehow, I certainly can’t begrudge those who did, because he’s certainly compelling in every conceivable way, even if the material and arrangement weren’t quite up to his level. A decent tune with a great performance is almost always worth more than a truly great song with just a decent reading of it and that’s the case here as well. Darnell was now a star and who doesn’t want to star gaze on a clear night? 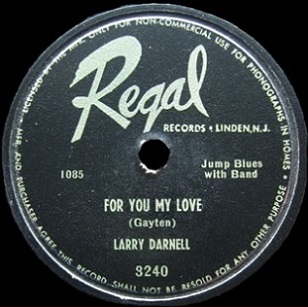 Leave a reply on "Larry Darnell: “For You My Love”"